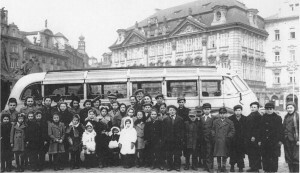 My sister Helen and me among the children leaving Prague for an orphanage in France. Our uncle found us through this picture. Ruth Rosenfeld, a resident of Monmouth County, NJ, has an absolutely touching story about her childhood in Europe during World War II. Many stories from survivors leave you pondering the great evil that mankind is capable of. However, Ruth Rosenfeld makes you also consider the strength of human kindness. Among the darkest moments of human history, there were unrecognized heroes who risked their lives and the lives of their families with acts of morality to save victims of the Nazis. Her father crept out of the attic with Ruth and her sister and sought out a Communist friend, asking for her help to hide them. This righteous Christian woman took them in and tried to help them escape on a train to Czechoslovakia. Unfortunately, things didn’t work out well. On the train the girls sat with the innkeeper, separate from their father. At one of the stops, a Nazi soldier from Wadawice recognized Ruth’s father as a Jew and took him off the train, shot and killed him. The Innkeeper took the two girls back to her inn and continued to hide them. Ruth remembers on several occasions having to rush down to the cold cellar because the Nazis suspected that the innkeeper was hiding Jews. She was hidden in large wooden barrels, covered with seeds, while the Nazis poked their rifles in the barrel checking for hidden Jews. Although the innkeeper kept the girls for a while, she realized that if they stayed with her they would be caught and they would all surely be killed. It was for that reason that she contacted Julia and Anna, two sisters who lived in the small village of Buczkowice, Poland. The women took the girls in claiming they were their nieces from a bombed village. The girls lived on this farm tending goats and taking care of geese until the war was over. After the war, a Zionist organization took Ruth’s sister from her Christian family leaving Ruth behind because they didn’t realize that she was there. Her sister, Helen, would not stop crying until they went back to find her sister. Ruth remembers the joy of seeing her sister again, knowing they needed each other for survival. The girls were smuggled out of Poland to Prague along with other children who had survived the war. After a few weeks, they were sent to orphanages in France. Ruth’s sister contracted tuberculosis and was taken care of in a sanatorium where she learned French from the nuns that were in charge of her care. The girls were malnourished and their skin was cracked with frost bite from staying in the Alps. It was at this point Eleanor and Sam Banker came from America to the orphanage with the intention of adopting Holocaust survivors. In September, 1949, Ruth and Helen arrived in America with their future adopted mother, Eleanor Banker. The entire community was ecstatic to meet the “two little French girls.” Ruth and Helen had no information as to who they were or where they came from until after they were married. All they knew is that they had been through the worst. An uncle who had escaped to Russia and was now living in Israel was trying to track the girls down and would not give up his search. 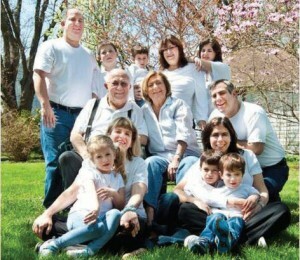 From a picture in the book My 100 Children by Lena Silberman, their uncle was able to find them. Most of what she knows about her family’s previous life has come from this uncle. Ruth’s Family: Standing left right, Aaron, Daniel, Michael, Jinni, Ellie. Sitting in center; Gerry, Ruth. On the ground; Judy, holding Linda, David, Sarah holding Evan and Ezra. Through all of the tragedy, Rosenfeld appreciates the fact that she would not have survived without the generosity of others. Although she cannot find the name of the Innkeeper that saved her and her sister’s lives, she was able to successfully express her gratitude by having Julia recognized as a “khassidey umot ha-olam” or “Righteous Among the Nations.” The thought that good can be found even in the most treacherous of environments is enough to instill faith in us all. Nowadays Ruth is married and lives a few blocks from Helen. They remain extremely close after their experiences together proving the strength that comes with love and familiar ties. She was able to go to Poland to get firsthand experience in investigating her roots and to meet all the people that saved her when she was a child. It was amazing to hear Rosenfeld’s story and we are all so lucky to learn the lessons that are associated with it.